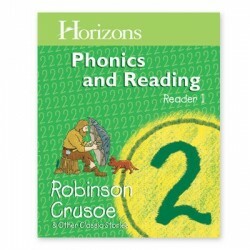 Discover the fun of reading with the Horizons 2nd Grade Phonics & Reading Student Reader 1—Robinson Crusoe & Other Classic Stories from Alpha Omega Publications. Your homeschool child will quickly learn to read using 80 phonics-based poems and short stories that stress moral values and godly character qualities. Each enduring story in this fun-filled reader uses one- and two-syllable words to reinforce and correlate with phonics rules taught in the Horizons 2nd Grade Phonics & Reading Student Book 1. The result? As your child decodes new words and improves his reading fluency, he'll also increase his reading comprehension. Inevitably, he'll have so much fun reading; he'll want to reread the stories several times! But there's more! A thought-provoking principle relating to the content of each story is also included and can be discussed either before or after reading the selection to further enhance desirable character qualities. Plus, the user-friendly teacher's guide has comprehensive and review questions that make each story in this fun-filled reader come alive. Sound fantastic? It is! Add a copy of the Horizons 2nd Grade Phonics & Reading Student Reader 1 to your shopping cart today!